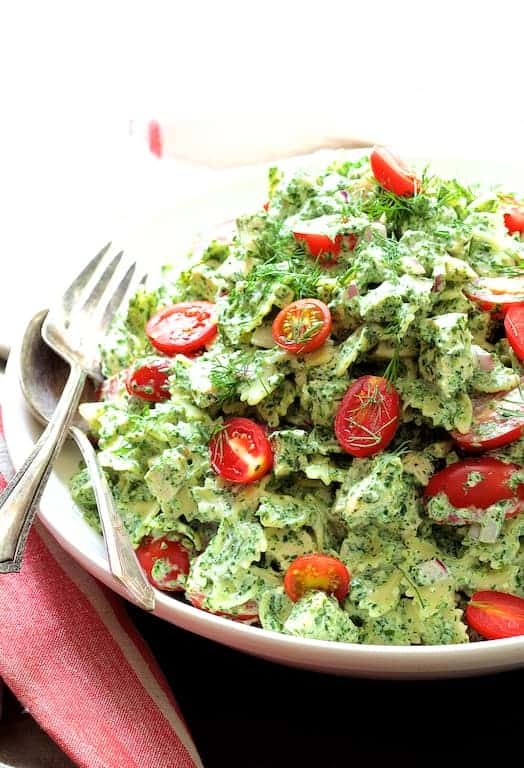 This Chicken Pasta Salad with Spinach Buttermilk Dressing is an oldie but goodie of mine. It is inspired by a recipe in 365 Ways to Cook Pasta, For Every Season, For Every Reason, A Pasta Lover’s Paradise by Marie Simmons. 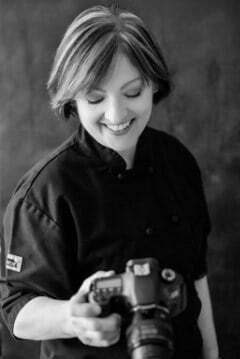 The cookbook was first published in 1988, updated in 1996 and again in 2005. A pasta salad may not be on the cutting edge of culinary evolution. However I’ve made this for potlucks, bridal showers, funerals and personal chef clients and it’s always a hit. 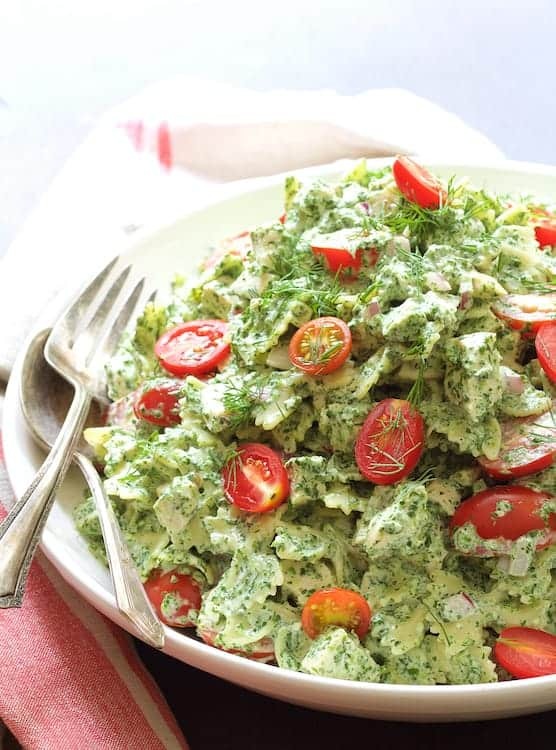 Roasted chicken, bowtie pasta, mayonnaise, buttermilk, spinach, fresh dill and tomatoes combine for a salad that’s a budget-friendly crowd pleaser. I use bowtie pasta because it’s pretty, but penne or rotini (regular, whole-grain or gluten-free) also work. After cooking the pasta, drain in a colander, rinse with cold running water to cool and remove excess starch, drain well, then toss the pasta with a small amount of oil. The oil keeps the pasta from absorbing too much of the dressing. If you’re making this salad ahead of time, the oil prevents the pasta from drying out and getting stick in the refrigerator. Save time by using rotisserie chicken instead of cooking the chicken yourself. The dressing comes together quickly; simply combine all the ingredients in a food processor or blender and process until smooth. Buttermilk is a wonderful ingredient to keep on hand, especially for salad dressings. It’s much lower in fat than sour cream and adds a delightful tanginess. Squeezing the water from frozen chopped spinach can be a nuisance. However, because the spinach is going into a liquid, it doesn’t need to be perfectly dry–just give it a reasonably good squeeze. A nice variation would be to use peas instead of the tomatoes. This post contains an affiliate link. I only recommend items I’m madly, deeply passionate about. Thank you for your support! 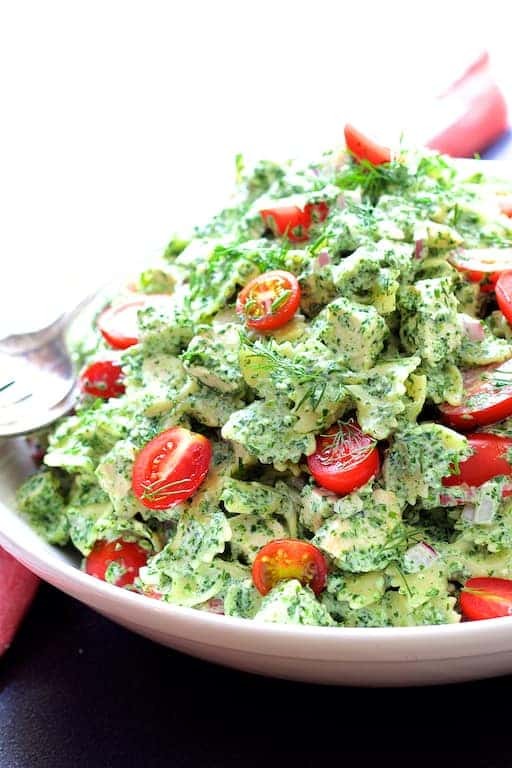 Cool, creamy and tangy, Chicken Pasta Salad with Spinach Buttermilk Dressing is a budget-friendly way to feed and please a crowd! CHICKEN AND SALAD: Preheat oven to 375 degrees. Drizzle chicken with oil and season with salt and black pepper. Roast for 22 to 25 minutes or until cooked through to at least 165 degrees. Let cool, then cut into 1/2-inch pieces. DRESSING: Combine all ingredients in a food processor or blender. Process until smooth. Pour dressing over salad and toss to coat. Serve immediately. MAKE-AHEAD: Cook chicken and pasta. Chop chicken and refrigerate. (Chicken and pasta may be stored together in a container). Make dressing and refrigerate separately. Before serving, halve tomatoes and dice onion. Add dressing, toss and serve. VARIATION: Use fresh or frozen peas in place of the tomatoes. I love bowties too! They’re one of my favorite pasta shapes! Your salad sounds delicious…I’ll definitely give this a try!